It's happening again! A tropical cyclone is set to have a major impact on the weather across the United States. Remember Nuri last year (Nuri Post)? It brought a major pattern change, one to a cold trend. Oho, seen below, is set to have the opposite effect. Its track takes it north right on into the jet stream, which will help to build a ridge to the east of its track. 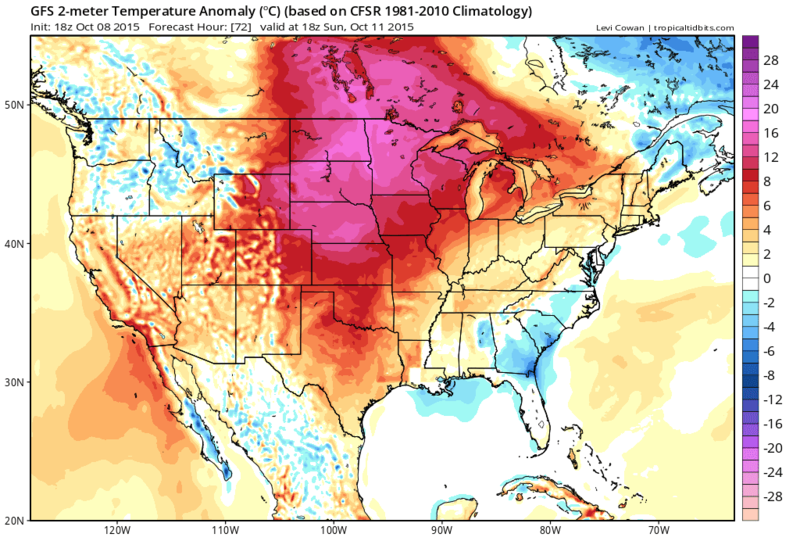 This ridge will then propagate to the east and set up over the mid-section of the country for the weekend, bringing widespread 80s and 90s the parts of the Midwest. Building the ridge is one way to bring warm weather to the area, but another method is also in play. With the counter-clockwise rotation around the deepening area of low pressure the winds will be out of the SW and create an onshore flow from the Pacific Ocean. As this flow persists, heavy rains will fall in the mountains and air will be forced up the front range of the Rocky Mountains. As this occurs air parcels will cool as they rise to levels of lower pressure. This cooling will allow for saturation to occur and increase the amount of rain in the area. Then on the lee side of the mountains the opposite will occur. The air that was once going up the mountain will fall down on the opposite side. 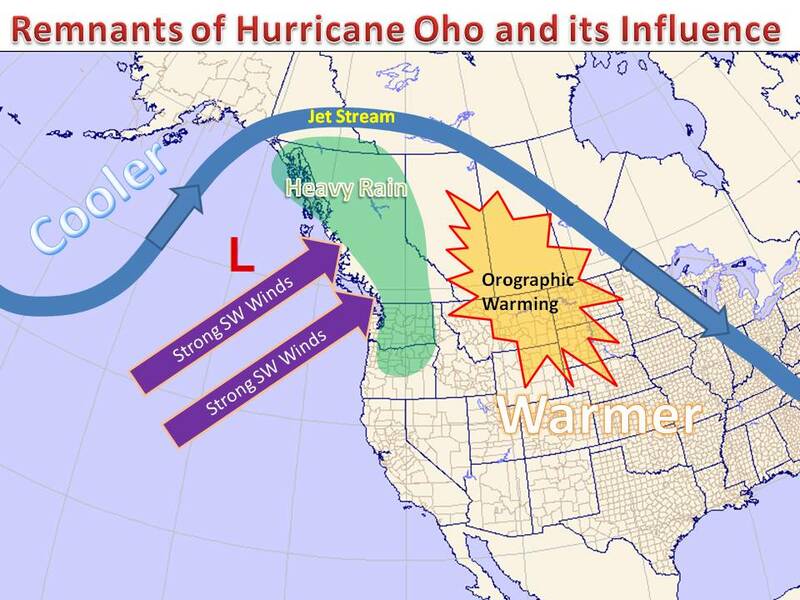 This will bring warm weather through a process called orographic warming. The air is forced down to higher pressure, which will act to warm the air parcels. The image on the left is the GFS model for 850mb temps Saturday, notice the vast area of warmer temps through the Dakotas and points northwest? Orographic warming can be thanked, along with Hurricane Oho for the pleasant conditions! The map attached to the right shows just how much above normal temperatures can get on Sunday. The high temperatures on Sunday will run 15-30 degrees above average and record highs will be in danger. Would not be surprised to see some 90s in the Northern Great Plains! The weekend will also feature dry Canadian air, with dew points in the 50s. It can definitely be described as Indian Summer, all aided from a Hurricane that once threatened Hawaii.